After installing a new battery pack in my Newton eMate 300, I wondered about the pack’s abilities: how long did it take to charge? How could I find its exact charge capacity? How long would it take to discharge? Thankfully, I found a super-useful application (thanks to Tony Kan) to find all this out: Frank Gruendel’s NewtTest. NewtTest will only show tests that make sense on the particular machine it is running on (you won’t, for example, find the backlight test on an OMP). Hence it will look different on different Newton models. 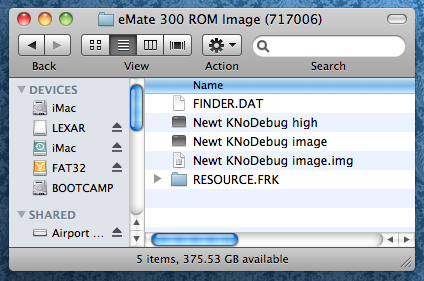 Once you install NewtTest on your Newton, you have access to tons of great tidbits of data. From the most detailed, like the above screenshot under “System Info,” to a “Backlight” feature that simply lets you turn your backlight-capable Newton on or off. For my own use, the “Battery” section showed my eMate’s capacity, temperature, and voltage. 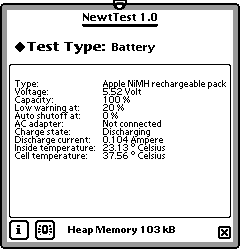 It also recognized the type of battery pack I installed as an Apple NiMH rechargeable pack. Gruendel’s attention to detail here is impressive, and much-appreciated. Another benefit is the “Clock” feature. If you’ve ever had to reset your Newton’s clock (on OS 1.x models) or calendar date (on any Newton), you know how frustrating it is. NewtTest makes it simple by letting you pick the year first (above) and then worry about the date. Since my eMate was constantly running out of juice, I spent a lot of wasted time resetting the date by scrolling through the months and years (usually starting with 1997). NewtTest’s “Clock” feature becomes a big time saver. 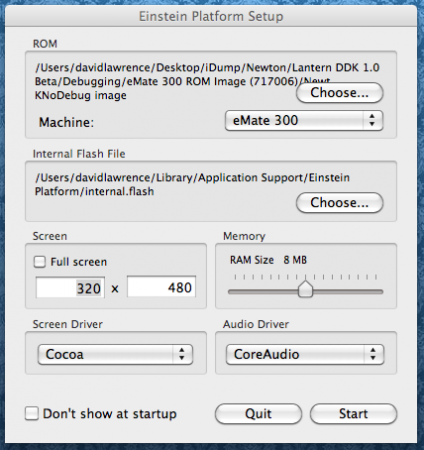 Other “Test Types” in NewtTest, like testing the sounds on your Newton (cuckoo!) and calibrating the digitizer, are so helpful I wonder how I’ve lived without them. For instance, my eMate’s screen shows a few faded or missing pixels on the right-hand side of the screen. 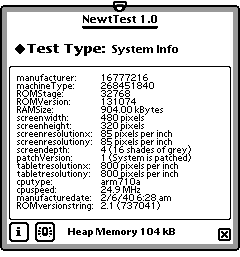 With NewtTest’s “LCD Display” test, I can show a fully black screen, or a series of horizontal lines. It turns out that my eMate has a vertical line of faded pixels running the entire length of the screen. That’s not good news, but it’s worth knowing. 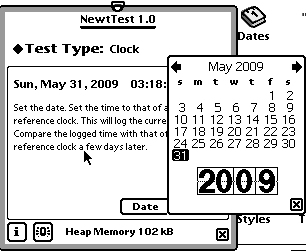 Gruendel has developed a few other applications for the Newton, but NewtTest is so practical that no MessagePad or eMate user should be without it. Posted by davelawrence8 at 6:00 am on June 1st, 2009. 2 comments... » Categories: eMate, newton, software. 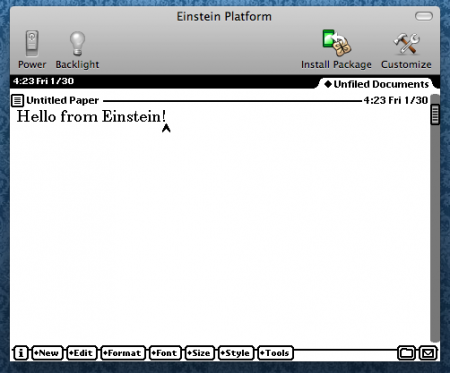 Tags: battery, eMate, frank gruendel, messagepad, newton, newttest, OS, pixel, screen. Subscribe via RSS. I used to say it was 1992-era Dylan. Dylan was a Lisp that Apple invented. 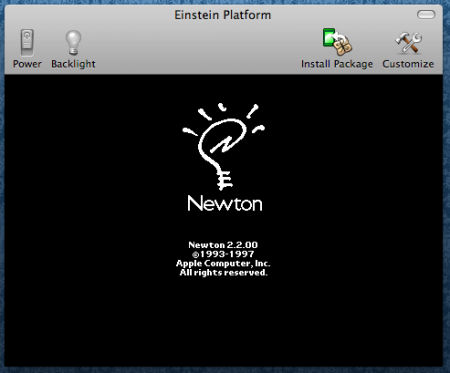 I worked for several years on Apple’s Newton project. 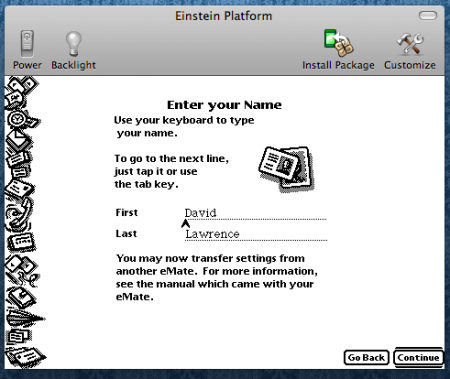 Newton was initially written mostly in Dylan, and I got to write a lot of OS code in Dylan. That was a time of high joy in my programming life. It didn’t last, of course. The story of Newton’s abandonment of Dylan and its other adventures makes entertaining reading, but the short of it is that eventually I had to stop programming in Dylan. Turns out Dylan is still around, but Levins has moved on to a Lisp dialect called Clojure. Posted by davelawrence8 at 6:48 am on April 27th, 2009. No comments... » Categories: newton history, software. Tags: apple, clojure, code, dylan, language, lisp, messagepad, newton, OS, programming. Subscribe via RSS. - John Gruber at Daring Fireball, on Apple’s too-intent focus on the Next Big Thing during the 1990s. Posted by davelawrence8 at 6:16 am on April 16th, 2009. One comment... » Categories: newton history. Tags: apple, daring fireball, iphone, john gruber, messagepad, newton, next, OS, steve jobs, units. Subscribe via RSS. 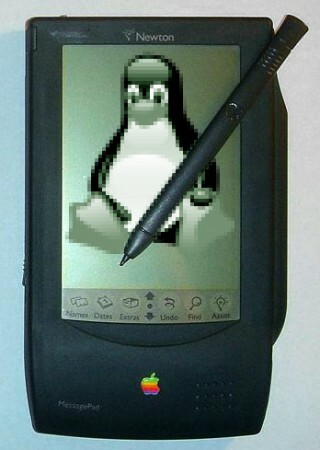 Owning an iPhone and a Newton, it’s always fun to poke around at other mobile operation systems when I get the chance. The other day, I put my stylus on a Palm for the first time, and got to play around with it for a bit. Gizmodo puts all the major smartphone OSes – RIM’s Blackberry, Apple’s iPhone, Windows Mobile, for instance – against each other in a run down of features, pros, and cons. The only classic mobile OS in the bunch is the “basically dead” Palm OS in the Centro, which is sad, considering (a) the Palm OS looks so dated with the other systems and (b) Palm succeeded where the Newton did not in a lot of ways. Now it’s a dying system. Posted by davelawrence8 at 11:38 am on October 14th, 2008. No comments... » Categories: software. Tags: android, blackberry, centro, google, iphone, ipod, messagepad, newton, OS, palm, RIM, symbian, windows mobile. Subscribe via RSS.